Bell Pepper and Paneer go really well together especially in this simple and tasty Curry recipe. I added mushrooms in this dish for an extra bite and the results are quite good. This quick curry dish will make your weekend dinner easier. 1. Heat oil in a wok and add cumin, fennel seeds and dried red chilli. 2. Add Onions and minced garlic. Saute onions. 3. Add bell peppers and mushrooms. Mix well and saute. 4. Add salt, turmeric and red chilli powder. 5. Add Paneer. Mix well. Add tomato sauce. Add water. 6. Add curry powder. Cover and cook for few more mins. 7. Finish off by adding garam masala, dried fenugreek leaves and cilantro leaves. Serve over rice. Paneer Butter Masala is often considered decadent, rich, creamy dish. Here we’ve created a healthier version without use of any butter or cream but no compromise on the taste. If you are a big fan of Paneer like, I am then do check out our other Paneer Recipes as well. 1. Saute paneer pieces in coconut oil and set aside once golden brown. 2. In same pan with a little bit more oil, add bay leaf. 3. Add in chopped onions and cashews. Next, add cumin, coriander, cardamom seeds, salt and chilli powder. 4. Mix well. Add minced garlic. Cook onions are golden brown and no longer raw. 5. Add in tomatoes. Once tomatoes are tender, blend all ingredients with a little bit of water. Remove the bay leaf though. 6. Pour curry in the pan. Add yogurt. Mix gently and add curry powder. Add paneer pieces. Let it all simmer for few mins. 7. Add garam masala. Finish off by adding kasoori methi ( dried fenugreek leaves) and cilantro leaves. Here is an easy and delicious Bell Peppers recipe for which you don’t need very many ingredients. Best thing is that bell peppers are available all year round where I love so we can enjoy this dish anytime of the year. Chop onions, potatoes and peppers. Heat oil in a pan or wok and add cumin seeds. After 30 secs, add onions, garlic, salt and turmeric. After 2-3 mins, add potatoes, bell peppers. Mix well. Cover and cook for 7-8 mins. Indeed a great side dish. 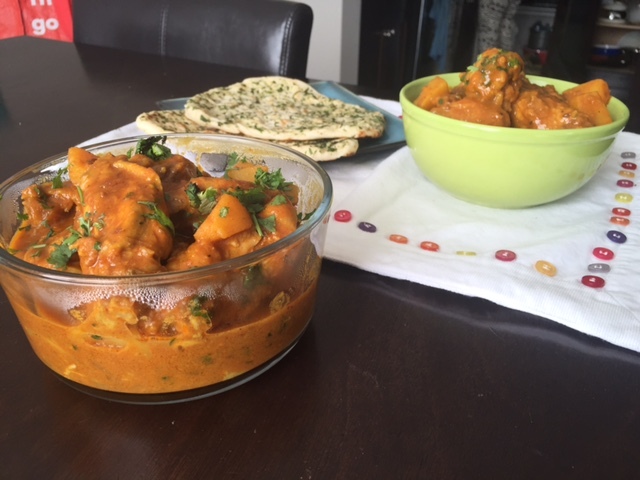 Chicken curry is simple and easy dish that can be enjoyed with rice, naan or roti. Homemade curry is healthier than store bought or restaurant dishes. Chicken drumsticks used in the recipe give great flavour to this curry. Here’s a simple recipe that even beginners can feel comfortable with. Besides, the following Chicken Curry Recipe, you might find the following dishes delicious as well. – Heat oil in a pan and fry coriander/cumin/mustard for 30 secs. – Add chicken. Mix well. Cover and cook for 3-4 mins. – Add tomatoes. Combine well with other ingredients. We wish a very happy New year 2018 to all our viewers, supporters, friends, partners and clients. Here’s to bringing you more exciting recipes, reviews and content in this upcoming year. Lentils is one of the most common food dishes made in Indian households. In this recipe video, you’ll learn how to make Brown Lentils (Whole Masar) in slow cooker and season it with flavorful Tadka. This Indian Lentils Stew is really healthy, easy to prepare and so hearty and comforting. These Lentils can be enjoyed over rice, with roti, paratha, naan or other kinds of breads. 1. Add lentils in slow cooker along with water. 3. Cook for 2 hours. 4. Prepare Tadka (Tempering/ Seasoning) by heating 2 tbsp oil in a wok. 6. Cook for 3-4 mins. Add tomatoes and let them turn mushy. Add in garam masala and mix well. 7. Add tadka in the lentils and let cook further for 30 mins. Cooking further is optional. These lentils will be thick. More water can be added during cooking process for soupy consistency. My husband makes wicked Portobello mushroom sandwiches and here is how he does it 🙂 We usually enjoy it on the weekends as a brunch with some sort of soup. 2-3 portobello mushrooms ( 1 mushroom per sandwich). Toppings of your choice – We use thin slice of tomato, Sauteed onions/peppers/spinach. You can use a leave of lettuce of too. Salt and pepper. 1-2 tbsp soy sauce. Any sandwich spread/ or add butter/ghee on the toasted buns. This is a wonderful spicy potatoes recipe which goes well with roti, naan or parantha. I not only enjoy it on road trips but also serve it as a side dish with lunch or dinner when company is over. Achari basically means pickled and gets the name because of all the wonderful spices being used in this recipe. Add Cumin seeds. Once they are crackling add onions and mix. After 30 secs, add ginger-garlic paste, turmeric and red chilli pwd. Stir all the ingredients and add cumin pwd. Add tomatoes and give them 3-4 mins until they are softened. Once they are done, add potatoes, half cup of water and salt per taste and let them cook on medium heat. Cover the pan and give potatoes around 10 mins. While potatoes are cooking, prepare the tadka/seasoning/tempering with some Indian spices. Heat 2 tbsp Mustard Oil and add tempering spices. Let them crackle and infuse the oil with their aroma and flavor. Turn off the heat. Once Potatoes are done, add this tempering on top along with some garam masala pwd and kasoori methi. Serve with roti/parantha or let them cool down and then put then in the lunch box and take them on your next road trip. More Tasty Indian Chicken Curry Recipe videos Here.